Machu Pichu was within reach but not yet in sight. 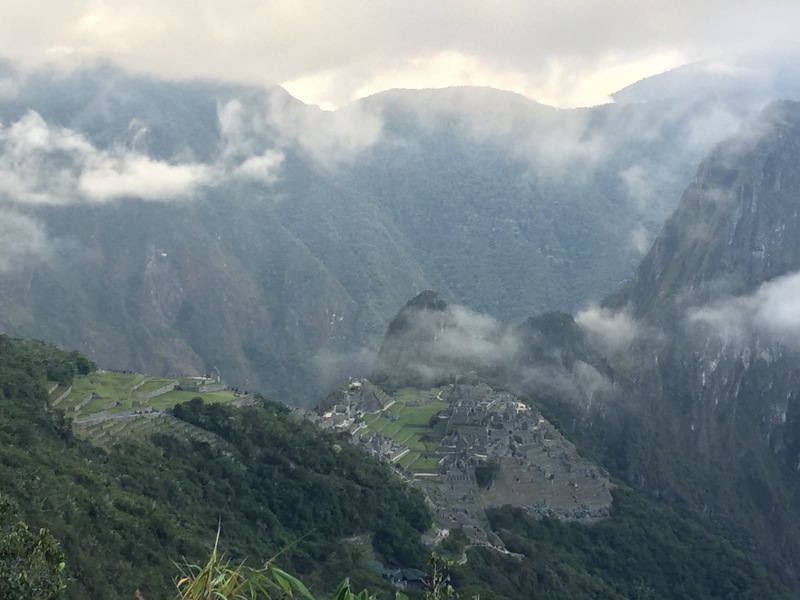 After three days on he inca trail we were itching to get to our last ‘wonder of the world’. It was an early start at 3am, with breakfast at 3:30 and out of camp by 4. But we didn’t have far to go, initially. The check point was on the lower path in camp and we sat in the dark with 200 others waiting for the gates to open at 5:30. Surprisingly it wasn’t all that cold as we sat there dozing in the pitch black with the smell of pee wafting through the air (the toilet being nearby). Finally the gate opened and we filled through. Miguel and Raul got our tickets stamped and we were off. We now had a 4km hike in the dark to the Sun Gate. Following the light of torches the path wound uphill at least a 1000m. The path was narrow but Miguel our lead guide set quite a pace: we overtook almost everyone who had been in front of us in the queue. It was in fact more of a run than a walk. Below, we could here the train coming through the valley taking the porters back to Ollantaytambo. They had a mad dash from 4am to get the train at 5:30am: the only one of the day they are allowed on. Miss it and they have to wait 24 hours! After an hour we reached a set of steps more steep than anything we had ever seen. In effect vertical: one woman was even going up on hands and knees. We scaled the steps and out of breath walked through the Sun Gate. It being early it was cloudy, and Machu Pichu hid behind the cloud. We waited for half an hour for it to clear but it stubbornly remained. We marched on keen to get below the cloud to see the city. 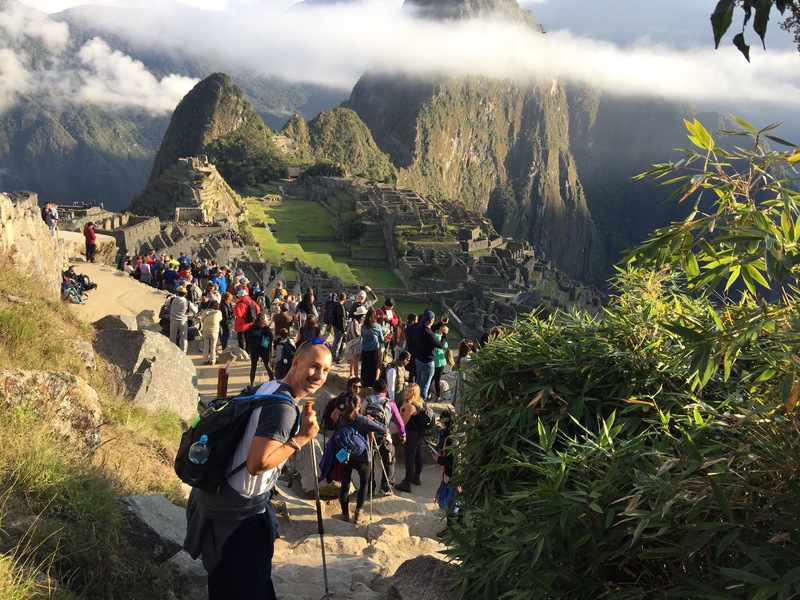 The path down to Machu Pichu was an easy slope and as we walked down the city of the Inca’s came into view. Built between to mountains (Machupicchu and Wineapicchu) it was spectacular. We walked closer and closer admiring the view of this spectacular sight. While 200 people trek through the Sun Gate daily, 2500 come up by bus. The crowds were already swarming in an attempt to get the perfect picture and be the first allowed in. 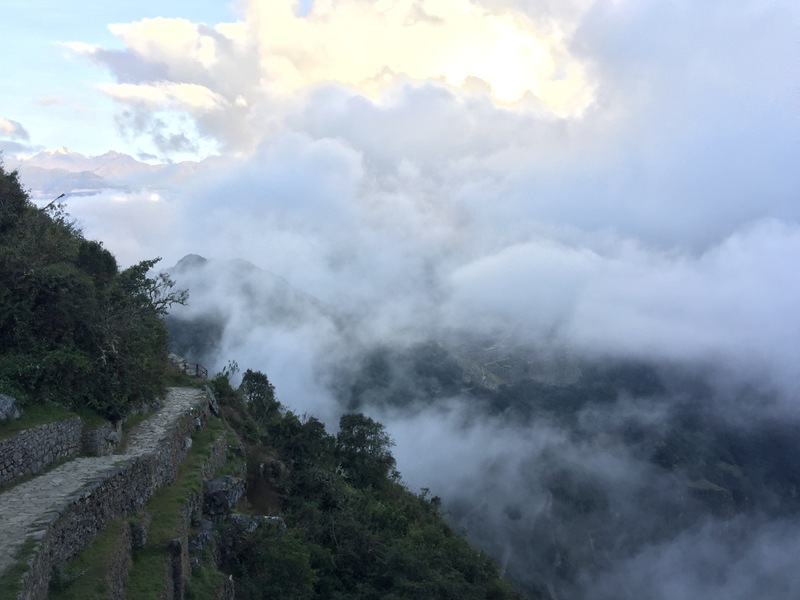 Being on the Inca trail and coming through the Sun Gate we walked straight into the city on the path above. We stopped as a group for the iconic photo looking down over the city as well as individual photos. Miguel then led us down to the ticket office where we met Kantu (our tour CEO) and handed over our walking poles and got information about our train times and how to get the bus into town. 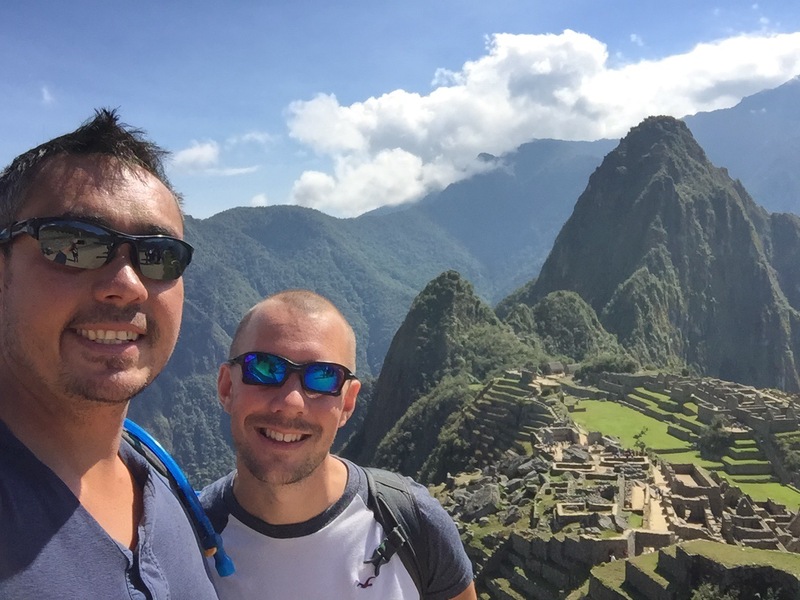 After stamping our passports we were allowed back in and this time Miguel took us into Machupicchu for a tour. We sat on a terrace in the long grass and listened. Built around 1450 and abandoned a century later during the Spanish conquest its purpose is still a mystery. It was known locally but unknown to Spanish and the rest of the world until an American historian, Hiram Bingham, discovered it in 1911. Miguel led us through the city and its famous parts. Particularly the Sun Temple; which has two windows. At the summer solstice the sun lines up with a crack in a mountain in the distance and pours through the window; at the winter solstice it lines up with the Sun Gate and comes through the other. An architectural masterpiece for its time. Another impressive part was the temple of the three windows, and when the some comes through the shadow of an Andean cross is formed. Many other buildings from royal dwellings and courtyards to commoner buildings are present. Walking around the buildings you could see the intricate work that went into building the city. What was also impressive, standing in the middle of he city, is how centrally located it is, in the middle of a bowl between the surrounding mountains – all at 2430m elevation. The surrounding mountains also have temples on top of the them, used for various rituals and sacrifices back in the day. After our tour we said goodbye to Miguel and Raul and decided to get a coffee before exploring more of the city. This proves rather difficult as officials insisted on a one way system that took about 30 minutes to navigate through the narrow passes. However, we got to see more of the city and eventually made our way out for an overpriced drink and something to eat. It was very much worth it having been trekking for four days! After a rest, with fatigue now catching up with us, we reentered (you can go in 3 times with your ticket). This time we climbed higher up to the rangers hut and beyond to get the best views. After some photos we settled in a sunny spot and admired the view. 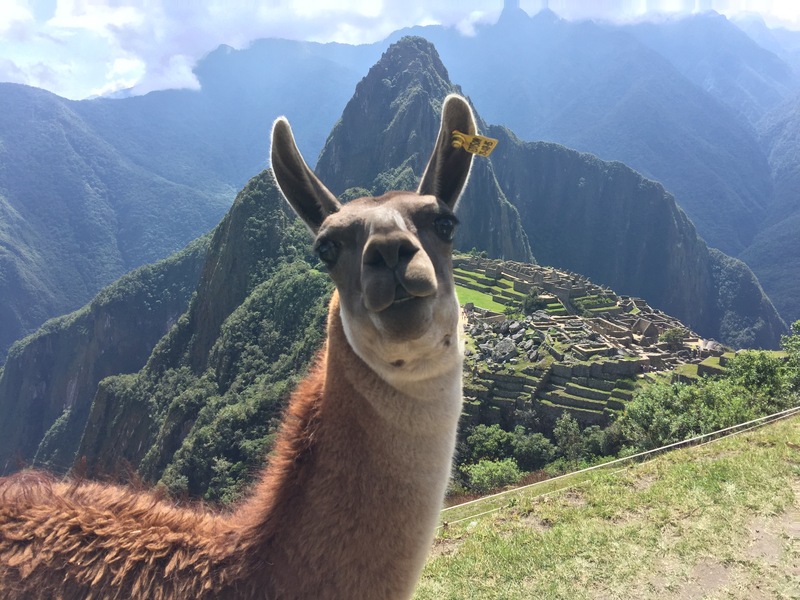 We said goodbye to our new trekking friends and went and found some llamas for the traditional llama photo with Machupicchu. Up close you appreciate how big llamas are, and how they are related to camels. With the help of some fruit we coaxed one lllama in for some photos. It now approaching midday, and the sun getting hotter we decided to make a move to town. The bus had a long line but it moved quickly and we were soon down the bottom of the valley in Aguas Calientes town. Here we had some food and caught up with the rest of our group and shared stories about our respective treks. 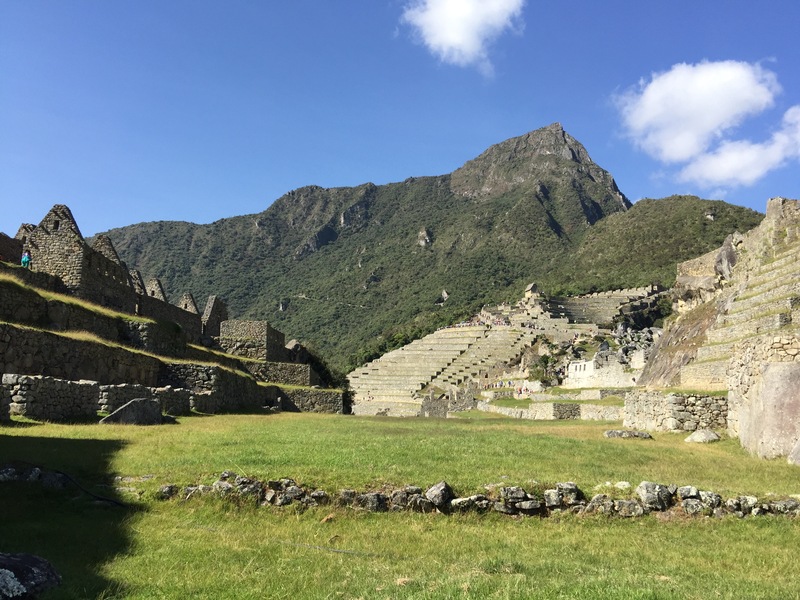 It wasn’t till the evening that we got our train back to Ollantaytambo and then bus to Cusco. Four and half hours later we were tucked up in bed ready to rest our weary blistered feet from four days of trekking. It had a been an amazing experience and one we would never forgot. Drinks and celebrations would have to wait till the following day (and they were messy!). Machu Picchu is so cool looking. This is first I have seen of the crowd watching from a distance. I guess it’s good that they don’t allow people into the actual site area, it wouldn’t be as pretty. Did you also learn about aliens during the tour?